Included with this model are two work bowls, a 16 cup (3.8L) large bowl and a 2.5 cup (600ml) small bowl. Both are BPA-free. 2. virtually eliminates leakage when processing large amounts of liquid ingredients. 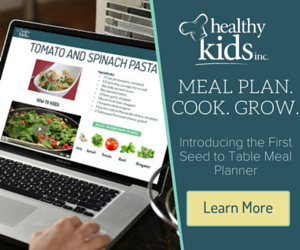 This is a well designed feature that you’ll appreciate when making large batches of soups. There is a spindle in the center of the bowl that the blades are attached to and also a Silicone Seal where the processing bowl and lid meets. The small bowl needs to be inside the large bowl in order to work. It does come with its own S blade. It is not sealed like the large bowl though. The small bowl is used for small jobs like mincing garlic. Note: You cannot use the other discs with the small bowl, only the small chopper blade works with it. Breville recommends hand washing the bowls and lid with only occasional washing in the dishwasher. potatoes without first having to cut them down to fit in the tube. This model has the largest feed tube opening of all the models I’ve reviewed so far. Great for working with even large potatoes. Along with the feed tube you get the large and the small pushers. The small pusher is great for carrots and leeks or when you don’t need to use the pusher and it also doubles as a measuring cup. The included Breville food processor dough blade is great for making pastry, cookie and pizza dough. Some users claimed that this machine does not work well for yeast based dough. Because it is so powerful, it heats the dough in seconds. You need to keep a careful eye on your processing time, but it’s takes a bit of trial and error and experimentation to get it to work. The touch pad control is smooth, classy and clean with stylish round buttons. LCD count up and down timer – how the timer works: The first time making your recipe, you would use the timer to count up to figure out how long it takes. Once you know that, then you can program the timer to count down the exact amount of time needed and it’ll stop the processing when the time is up. You should make a note in your recipe about how long each step took, otherwise you probably wouldn’t remember how long to run it the next time you make it. This feature is going to save you a lot of time and help you keep your recipes tasting consistently time after time. This machine has a robust 1200 watt Induction Motor. An induction motor has very few movable parts, so it lasts a very long time. I think that’s why the unit comes with a 25 year warranty on the motor. Induction technology is what makes the processor so efficient. The induction motor is so powerful that a takes only a few seconds to get food chopped, sliced or shredded very evenly. The Breville BFP800XL/A food processor comes with a great selection of blades. They are constructed of very high quality stainless steel so they are going to last a long time. Micro-Serrated S Blade™ – this blade chops raw and cooked meats and vegetables. It purees and makes soups. You can make your own healthy ice cream and smoothies also. Adjustable Slicing Disc – I think this disc steals the show. It has measurements on the back of the blade where you can adjust how thick or thin you want your slices to be. With 24 settings from paper thin 0.3 mm to 8 mm thickness, you can slice to your heart’s content. Even hard to slice high water content veggies like tomatoes are sliced uniformly without turning into tomato puree. I watched a video of the blade in action and it is amazing. With just the turn of the knob you can adjust to your desired thickness. I like to roast zucchini and I have a very tasty roasted sweet potato recipe, I slice the veggies by hand and I always end of with thick and thin slices of the zucchini, and the sweet potatoes, well they end up in all sorts of shapes and sizes. When I saw how perfectly sliced the potatoes and zucchini turned out using this blade, I fell in love. Julienne Disc – this is great for cutting carrots and zucchini. French Fry Cutting Disc – makes perfectly cut french fries in seconds using regular potatoes or even sweet potatoes. Reversible Shredding Disc – this is a very cleverly designed blade, one side is coarse and the other side is fine. You can use the coarse side to shred cabbage or potatoes and the fine side for carrots or cheese. Whisking Disc – when you need to whip heavy cream or egg whites, no need to pull out the old mixer, just use the emulsifying disk. It does an excellent job of making milkshakes as well. It’ll whip your ingredients in seconds, but it make take some initial experimentation to get the results you’re after. Disc Spindle – fits onto the bowl drive coupling and is used to hold all of the discs (except for the chopping blade) in place. I like the way it is designed, you fit the spindle in the bowl then place your chosen blade on top of it, so it is easy to change blades. I was comparing this to the Cuisinart models. These come with one disc stem for the blades and you attach it to the blade first then put it in the bowl. So when you need to change disc, you have to take the whole thing out, place it on your counter, disconnect the stem from the blade and re-attach it to your next blade. The Sous Chef’s design is more efficient because it cuts down on all these steps, just take out one blade and put another one in, simple. place and dust-free. It’s fully labeled so you know where each part goes. The case can be stored on its side so it takes up less space. This custom storage box is unique to the Breville. None of the models I have reviewed so far come with its own blade and disc storage and it is not even an option except for the Cuisinart. Customers are raving about how great it is to have their own custom storage for all of the attachments, no need to store sharp blades and disc in the drawer or go out and buy plastic containers. The solid die-cast metal base is easy to clean and does not show fingerprints. It has a safety locking system and non-slip feet to firmly keep the machine anchored to the working surface. A cleaning brush for cleaning the bowls, blades and discs. There are a good number of reviews for the Breville BFP800XL/A Sous Chef food processor, not as many as say a Cuisinart. However, the customers were very satisfied with their purchase and felt it was worth every penny they paid for it. Words that kept popping up in the reviews were amazing, powerful, fast and very efficient, sturdy well-built, smooth running, easy to operate, durable, performs like a champ. Customers just love that there is no “hole” in the center of the work bowl and that it comes with a storage case for all the discs and blades. A couple of users had a problem with the power cord getting stuck and not coming out all the way. If that is the case you can always leave the cord out. Another minor complaint is that the tip of the disc spindle and blades gets hot. If you’re using the blades long enough for them to heat up, then you should let the machine sit for a few minutes so the blades could cool down before you touch them. Overall though, the reviews are overwhelmingly positive with many enjoying using their new kitchen toy. In fact, several people have gone back to Amazon several years after using this food processor and commented on how much they STILL enjoy it. That’s the kind of feedback you want to see when paying the higher price of this model. You can buy a Breville food processor online. The cost of this model will set you back about $400. It costs more than other food processors on the market, but well worth it considering all you’re getting. In addition, the Sous Chef comes with standard accessories – the julienne disk, the french fry disk, emulsifying disc and the the custom storage caddy – that other brands only offer as add-ons that you have to buy separately. It is well designed and built to last, so you are not going to be replacing this every year or so unlike a cheap $30 machine. The manufacturer stands behind their product. You’ll pay a premium price but what you get is a premium product, well made and solid. The Breville is an expensive machine, but if you like to cook a lot, it is worth the investment. The combination of speed and performance, the powerful motor, the included blade and disc holder, and all the different blades make it well worth the price. You may see two different models of the Breville, the BFP800XL and the BFP800XL/A. The difference is that the 800XL shredding disc had a problem with shredding cheese and there was a disclaimer in the manual that shredding cheese voided the warranty. However, Breville redesigned the disc and the new model number is BFP800XL/A. This workhorse of a machine is incredibly versatile, fast and efficient, but it is also big and heavy (weighs about 20lbs) and it’s about 18 inches tall. Something to think about, because if you don’t have space for it on the counter, then you may end up having to lift that heavy machine every time you want to use it. In addition you need to figure out where to store the blade and disc holder. 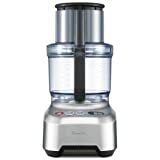 If this is your first food processor, you may find it to be a little intimidating because of all the features and blades that it comes with. So expect a learning curve until you get the hang of things. But you’ll soon find that once you start working with the Breville, things will go a lot quicker and you’ll become more efficient each time you use it. Practice makes perfect! When spending almost $400 for a food processor, you want to make sure that it is durable and will work for a long time. It should also cut down on your food prep time, not add to it. You also want to be sure the manufacturer stands behind their product. The Breville BFP800XL/A Sous Chef Food Processor meets these criteria. So if you need a large capacity work horse, you can’t go wrong with this one. I have a sous chef at home and I’ve lost the small plastic spatular. Are you able to send me a new one or do you know where would send me one, I live in Australia. Contact the company, Breville, directly. Super disappointed that there is not french fry disk available for the 12 cup plus food processor. What’s the point of the wide mouth?? I didn’t need the super huge 16 cup processor, but I would still like the same food prep options in the 12 cup plus. For $400.00 I have two disks to use only. Garnish sandwiches with radish flowers or fresh vegetable slivers for extra visual appeal. When making large batches of sandwiches, prepare these garnishes ahead of time and store in jars of ice-cold water till serving time. Drain and let sit on paper towel for a few minutes before garnishing plate.